It is a sad day in California. As the last rays of Northern California summer warm my face I am reminded of the thousands of women in our jails and prisons who are not only without freedom, but also pregnant...and still in shackles. That is, until the California State Sheriffs Association registered opposition at the eleventh hour, literally two weeks before a the deadline for the Governor’s signature or veto. Opposition that was irrelevant; concerns that had us wondering whether or not they’d read the bill at all. The kind of opposition that could not be negotiated. In fact, our little bill about 4 percent of their female population ruffled their feathers to the point of being a top priority veto. Why had they not raised their concerns earlier when we could have done something? Why were the Sheriffs the only law enforcement entity concerned, while we had support from the prison guards? It is this kind of paralyzing opposition with such power that led us all to believe some other motives were afoot. Concern #1: Handcuffs could not be used on pregnant inmates. Fact: First, let’s keep in mind that 85 percent of female inmates are non-violent offenders and counties with no-shackling policies in place have NEVER experienced escape attempts or safety issues. 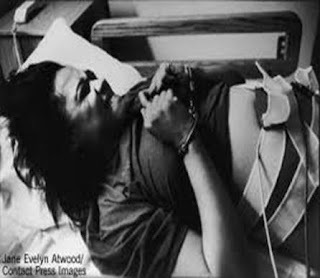 But AB 568 clearly states that when deemed necessary for the safety and security of the inmate, staff, or the public, restraints could be used on a pregnant inmate and these could include handcuffs in front. Concern #2: Circumstances under which restraints are necessary are not well-defined. Fact: During the previous legislative session when we were trying to pass AB 1900 (Skinner), law enforcement officials were concerned that officers would not be allowed discretion about the use of restraints. Hearing their concerns, we made AB 568 more explicit this year and continually affirmed that officers who already receive more training on restraint than any other subject (over 28 hours) and with basic standards in place, should be able to use that judgment when it comes to restraining pregnant inmates when necessary. So, which do they want? More discretion or more direction? Governor Brown should have stuck with his first instinct instead of allowing himself to be misguided by a powerful lobby. In my frustration, I have to remember this work is not over. Just last year, Hawaii, Idaho, Nevada, and Rhode Island all passed laws prohibiting shackling during labor. Efforts in Florida, Georgia, and Virginia were undertaken this year. While California would have been the first state to limit the use of restraints throughout pregnancy, these waves of activity will eventually create a tide too great to hold back no matter how conservative the state or how misguided the governor, or how strong the Sheriffs Association. Our attempts in California were not a failure, but another lesson. Trust that we will come back stronger, smarter, and ready to take on whatever comes our way. We will not stop until pregnant women and all those who find themselves in California’s correctional facilities are treated with fairness and dignity. Alicia Walters is a reproductive justice advocate for the ACLU of Northern California. Alicia has worked on passing California’s anti-shackling law for the past two years.